J.K. Place's location in Florence is a dream, close to everything, and directly across from the Basilica di Santa Maria Novella. Ever since owner Ori Kafri told me about his new hotel that was opening, I could not wait to see it. Finally in late October 2004, Edward F. Nesta and I had the opportunity to stay at J.K. Place (www.jkplace.com), which opened in May 2003, and is part of the Small Luxury Hotels of the World (SLH) collection, (www.slh.com). The wait was definitely worth it for this gorgeous 20-room hotel. First of all, the location is a dream, close to everything, and directly across from the Basilica di Santa Maria Novella. From the minute you enter the door of the hotel, you feel like you are staying at a friend’s home, where they have taken care of every small detail to make your visit comfortable. The foyer is decorated with framed black and white sketches on the wall, there is low music playing and the air is delicately perfumed from scented candles located throughout the hotel. Just off the foyer there is a comfortable sitting room with fireplace, a zebra print ottoman, sofa, sculptures, a floor to ceiling library bookcase filled with an assortment of books, as well as large-scale art books scattered on tables, and soft shawls placed on high back chairs that flank the fireplace and invite guests to linger. 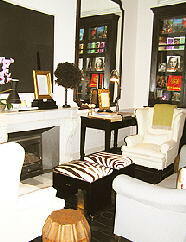 The reception area is in a small study with a hand-painted ceiling. Beautiful details include live orchids, and there is a selection of CDs, DVDs, and Florence guidebooks that await guests’ use. The inviting well-lit Dining Room has a glass atrium ceiling. The long wood table was set for ten guests, and was decorated with two large coach lanterns and tall vases of bright red amaryllis. 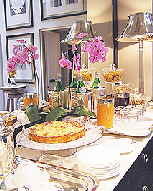 The sideboard held a lovely buffet breakfast each morning, as well as an assortment of complimentary beverages and snacks throughout the day. In the late afternoon, guests can enjoy tea or coffee as well as freshly baked pastries. There is another larger sitting room where guests can watch television in relaxed comfort on the white wool wall-length sofas that line two of the walls. The sofas beckon with comfortable pillows and soft shawls that guests can snuggle up in and read a book, use the Internet or just listen to music. Small details show up even in the elevator, with a corner stool where guests can relax on the short ride up in this four-floor hotel. Outside our door was the latest in technology, with a doorbell, and a keypad, which indicated Do Not Disturb as well as SOS. Our large room had a large mirror and pictures on soft green walls, and the king bed was luxuriously adorned with a champagne colored coverlet and slate gray and cream and gray wool pillows, there were reading lights over the bed, as well as an assortment of guidebooks, magazines and art books thoughtfully set on the bedside tables. There was a flat screen television on the long desk, and free high-speed broadband Internet access was available in the room via a cable supplied by the hotel. The dressing area had a nice surprise of a complimentary mini-bar stocked with mineral waters, sodas, and small snacks. There was also a CD/DVD player, safe, and amenities of slippers, a hairdryer, sewing kit, and long shoehorn on a rattan tray. The white marble bathroom had a walk-in shower with large showerhead and a pull cord for emergencies. Behind the bathroom door there was a full-length mirror, heated towel rack, bidet, robes, and branded Lorenzo Villoresi amenities to pamper guests. On the fourth floor of the hotel, there is a small terrace perfect for relaxing on very wide black cushioned banquettes that lined one wall, as well as a table with director chairs tucked under the eaves offering a secluded place to dine or enjoy a cocktail. There is also a bit of a view of Il Duomo. The young staff is attentive and ready to assist in whatever a guest may require, from theatre or museum tickets to obtaining a rental car. Claudio Rossi, the Food and Beverage Supervisor always had a ready smile, as well as a wonderful new pastry to offer guests, and Claudio Meli, Head Concierge, as well as his team, helped with finding us a Mercedes rental car to drive to our next destination, Tuscany.